Country lovers, are you ready for another phenomenal year?? There’s one incredible act after another this season at the Isleta Amphitheater – Brad Paisley, Luke Bryan, Jason Aldean, Chris Young, Florida Georgia Line, and incredible support acts including Chris Lane, Cole Swindell, Dan and Shay, Kane Brown, and Chris Janson!! 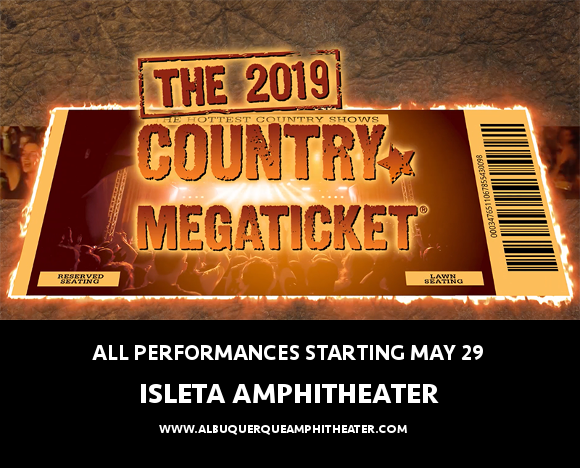 The 2019 country concert season begins at the Isleta Amphitheater on Wednesday 29th May 2019 – make sure you’re there for every show! Grab your tickets NOW and get ready for months of happiness with the biggest stars in country!! This year, the Isleta Amphitheater is proud to host five of the biggest names in country. If you just can’t choose who to see, then you’re in luck – the 2019 Country Megaticket offers you not one, not two, but ALL of these shows at one truly unbeatable price!! It’s time to get your hands on the Country Megaticket – your pass to seeing every single one of these shows in 2019 at one low price!! This special deal won’t be around for long, so make sure you grab it while it lasts and snag your Country Megatickets for 2019 today!! We’ll see you at the concerts! !